Ihsanijah Mukarramah Alim from Muzaffarpur, Other Graduate. EASY ADAPTABLE TO NE.. INOVATIVE AWARE OF EXCELL STRAIGHT FORWARD STRATAGY PLANNING &I.. CHILD CARE SRVICES CARE & LOVING SMART & HARD WORKER QUALIFIED GOOD COMMUNICATION ..
are one of expert skill area's of Ihsanijah Mukarramah Alim . 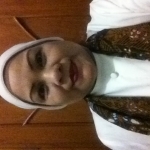 Ihsanijah Mukarramah Alim is working in Doctors/Nurses/Medical Professional industry.